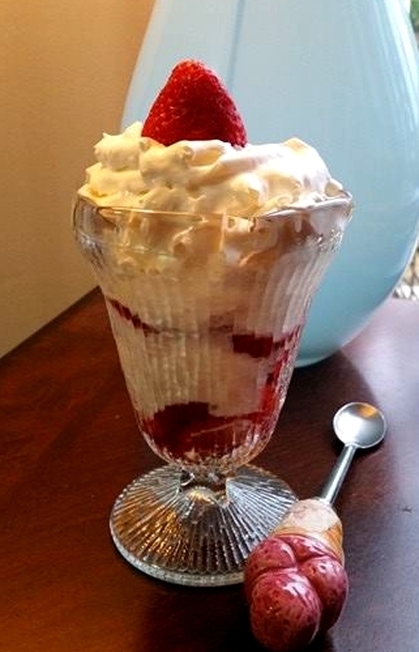 I can't think of anything more deserving of a summer celebration than a beautiful strawberry sundae! Of course, I may be a tad biased as strawberries and ice-cream are my favorite things! Red is my favorite colour, after all! I googled the word sundae just to see what the definition is, and it says that it is ice-cream served with syrup poured over it, often with other toppings added, such as fruit, nuts, sprinkles and whipped cream. Strawberries mark the beginning of summer for me! I have picked countless pounds of them in my lifetime, and consumed many pounds of them, as well! I only like two flavours of ice-cream - vanilla and raspberry cheesecake and that one I only like in a cone - I know- weird!! Did you know that, apparently, if vanilla ice-cream is your favorite flavour, you are a most adventurous spirit? It has something to do with all the different flavours you can add to enhance the flavour. I love strawberries and ice-cream, but I don't like strawberry ice-cream, unless it is homemade with fresh berries. Celebrate today with a luscious strawberry sundae, loaded with fresh berries and tons of whipped cream! I did- I had the one in the photo for breakfast!